Life by the Creek: Hurray! 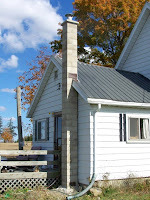 Our chimney is fixed! Hurray! 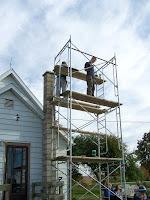 Our chimney is fixed! 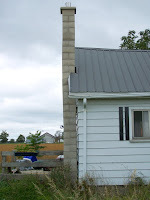 Our chimney was put up in 1999. Over the last few years, we have noticed that it was starting to fall over. That did not make us happy. This year, it had gotten really bad. 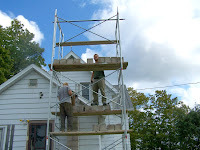 But, luckily, I have an AWESOME brother who does masonry! Yes!! 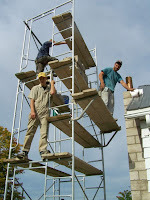 So, Matt and Patrick (the helper) came one day and took down the old, easily-shaken, Tower-of-Pisa-style chimney. And, on our beautiful Thanksgiving weekend, they came back, and put it up properly! 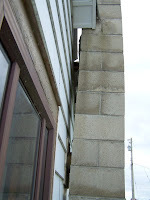 They even attached it to the house. And! Now there isn't a hole in the roof! Yahoo! 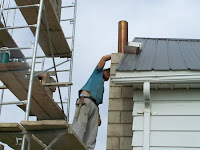 So now we are warm and toasty by the wood stove, and we're extra comfy since we know that we can use it without worrying that the chimney is going to fall over.